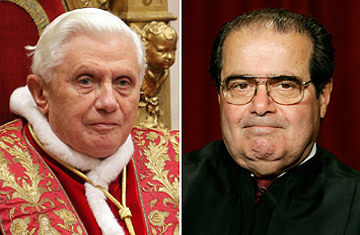 Catholic Judges and Abortion: Did the Pope Set New Rules? Much has been made of the statement on abortion that Pope Benedict XVI issued earlier this week after meeting with Nancy Pelosi. But the Vatican's choice of words as they related to the Speaker of the House was quite predictable, given her pro-choice stance and her position as a high-ranking Catholic Democrat. The Holy Father simply made clear their differences on the issue and reminded the American politician of her responsibilities as a Catholic to protect life "at all stages of its development." As a lifelong Catholic, Pelosi could not feign surprise at being called upon by the Church to use her gift for persuasion to restrict abortion legislatively, or at least not to be its advocate. But until now, the Church had not formally instructed judges in a similar fashion. As written, the Pope's statement has the potential, at least theoretically, to empty the U.S. Supreme Court of all five of its Catholic jurists and perhaps all other Catholics who sit on the bench in the lower federal and state courts. To get a sense of just how sharp a break with the past this is, all one has to do is take a look at what Supreme Court Justice Antonin Scalia, himself a Roman Catholic, wrote in 2002 in an essay in First Things. "[Abortion involves] ... private individuals whom the state has decided not to restrain. One may argue (as many do) that the society has a moral obligation to restrain. That moral obligation may weigh heavily upon the voter, and upon the legislator who enacts the laws; but a judge, I think, bears no moral guilt for the laws society has failed to enact," he wrote. "Thus, my difficulty with Roe v. Wade is a legal rather than a moral one ... [I]f a state were to permit abortion on demand, I would  and could in good conscience  vote against an attempt to invalidate that law for the same reason that I vote against the invalidation of laws that forbid abortion on demand: because the Constitution gives the federal government (and hence me) no power over the matter." Until the Pelosi statement, the prior instruction from the Church's Congregation of the Doctrine of the Faith and encyclical writing seemed to confirm Scalia's reasoning. There was an implicit understanding that the Church's admonition to its faithful to change the law permitting the choice of abortion had to be understood and applied in light of the scope of office. Catholic legislators make policy and could be so instructed, but judges, as Scalia wrote, had "no moral responsibility for the laws [their] nation has failed to enact." See pictures of Pope Benedict XVI's fashion looks.